We have all run into them. Net Trolls are players who don’t play well with others. These are the players who randomly type something incendiary into chat that is completely out of context with the current conversation. They are the ones who use obscenities, name calling, and even threats in order to harass and intimidate other players. There are many different ways to play World of Warcraft, but I think we can all agree that the Net Trolls are doing it wrong! You logged into WoW today because you wanted to work on getting your character to level 90. Maybe you wanted to finish a holiday quest before the world event ended. Or, you just felt like talking with your guildies for a while. Net Trolls log into WoW for one reason – they want to try and play you. Their goal is to get a lot of attention from as many players as possible. They strive for the biggest reaction they can manipulate another playing into making. There have been many WoW blogs that give detailed advice about how to handle a situation where some Net Troll has popped up to bother you, (or to harasses one of your friends). Instead of reiterating what has already been written, I’m going to share my perspective on what makes a Net Troll “tick”. It is normal for (most) humans to seek attention from others. Humans are social animals. Healthy humans want to receive positive attention from other people. To get it, they will compliment others, help others to do something, and just be nice to people. In return they usually will receive the same kinds of treatment. This is how friendships form, and how they are maintained. Net Trolls, on the other hand, are seeking negative attention. They want to make others feel upset, angry, or bad about themselves. This is extremely unhealthy behavior, and is an indicator that the Net Troll has some serious issues going on that you don’t know the details about. It is entirely possible that this person is dangerous or has a mental illness that is untreated. Every Net Troll is crying out for help, (but most don’t actually realize it). There are two reasons why a person decides to forego the chance to make a friend and instead decide to get negative attention. One: In the past, the Net Troll put effort into being nice to people, but things didn’t work out the way that he or she hoped they would. The Net Troll is now extremely hurt, and is fearful of reaching out to anyone else (even in small ways). 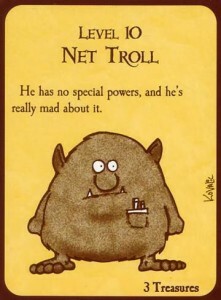 However, being human, the Net Troll still craves attention from others. Since the Net Troll believes that it is not possible for him or her to receive positive attention, the only other option is to seek negative attention instead. Two: The Net Troll honestly doesn’t know of any other way to communicate with people. These are the people who have incredibly dysfunctional home lives. If your parents cursed at you, called you derogatory names, and only paid attention to you when they wanted to scream at you, there is the potential that you would grow up thinking that this is normal behavior. These are the kids whose parents ignore them when they are doing something good. Instead, they become incredibly angry and abusive the instant the child does something wrong. If the choice is between no attention, and negative attention, many will choose to seek out negative attention. If the child doesn’t learn new, healthier, behaviors by the time he or she becomes an adult… well, that’s how Net Trolls end up screaming vileness in chat. There is a “secret weapon” that you can use to defeat Net Trolls. Put them on “ignore”. Don’t respond to anything they do. Act as if they do not exist. If you want to report them, that’s fine, but don’t tell them that you are reporting them. The Net Troll could see getting reported as a success. Net Trolls are absolutely desperate for attention. Starve them. As soon as they realize they can’t get the attention they so badly want from you, they will go away.